People are being nudged in many ways to improve their behavior. Nudging is any means that gently influences people to form good habits and make responsible decisions so they benefit themselves as well as the wider community. It also has great potential as a form of change communication. This new field of behavioral science influences people in easy and usually cost-free ways. It is based largely on the concept put forward in a book, Nudge: Improving Decisions About Health, Wealth and Happiness, by Nobel prize winner Richard Thaler and Cass Sunstein in 2008. Nudging opens up many possibilities for communicators to influence behavior changes on behalf of government policy (poverty reduction, early childhood development, community cohesion and respect, mental health and productivity at work, protecting the environment, volunteering and fundraising for charities, and personal wellbeing), as well as in marketing and in people’s daily lives. Governments are keen on nudging people into good habits without forcing them to make the change. An example of a health nudge is government encouraging delis and cafeterias to display fruit at eye level so it comes easily to mind for a customer to buy instead of less healthy options. This is much more subtle and acceptable than banning junk food. Supporters claim nudges are at least as effective, if not more effective, than direct instruction, legislation, or enforcement. 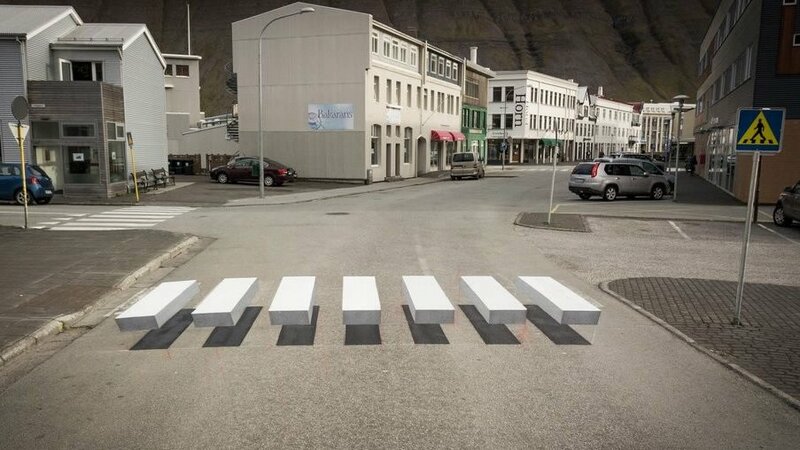 An example of nudging is this pedestrian crossing in Iceland. It has been painted on the road as a 3D image, which makes drivers take notice and approach the location more cautiously. Another example is planting roadside trees in a certain pattern to slow drivers as they approach built-up areas. A UK council found that using speed cameras was a costly way to slow down drivers, so it used a nudging technique by planting trees in the shape of a funnel. Trees were placed at steadily shorter distances apart on the approach to a village, causing drivers to see trees passing by faster in their peripheral vision. This influenced them to slow down because they thought they were going faster than they really were. Drivers slowed down by an average of 2-3 mph. Similarly, the UK Behavioural Insights Team drafted text within a standard penalty notice to drivers who had been caught speeding. The team simplified the visual format and improved the call to action, with text explaining why speed limits existed and the consequences of speeding. Results: Reoffending rates dropped by 20% within 6 months of driver offences. Almost 14% improvement in payments. Likelihood of prosecution reduced by 41%, and the new notices were paid 20% faster. Some people think this type of activity is manipulative and therefore undesirable, but if ethical considerations are properly taken into account, there shouldn’t be problems. These McKinsey articles are worth reading as well: “How to nudge your way to better performance,” and “A small nudge to create stunning team results” (subscription access). I find all this very positive and fascinating!